For a long time now climatologists have been tracking the global average air temperature as a measure of planetary climate variability and trends, even though this metric reflects just a tiny fraction of Earth’s net energy or heat content. But it’s used widely because it’s the metric that enjoys the densest array of in situ observations. The problem of course is that this quantity has so many bumps and kinks, pauses and accelerations that predicting its year-to-year path is a big challenge. Over the last century, no single forcing agent is clearer than anthropogenic greenhouse gases, yet zooming into years or decades, modes of variability become the signal, not the noise. Yet despite these basics of climate physics, any slowdown in the overall temperature trend sees lobby groups falsely claim that global warming is over. Never mind that the globe – our planet – spans the oceans, atmosphere, land and ice systems in their entirety. This was one of the motivations for our study out this week in Nature Climate Change (England et al., 2014) With the global-average surface air temperature (SAT) more-or-less steady since 2001, scientists have been seeking to explain the climate mechanics of the slowdown in warming seen in the observations during 2001-2013. One simple way to address this is to examine what is different about the recent decade compared to the preceding decade when the global-mean SAT metric accelerated. This can be quantified via decade-mean differences, or via multi-decadal trends, which are roughly equivalent if the trends are more-or-less linear, or if the focus is on the low frequency changes. A first look at multi-decadal trends over the past two decades (see below) shows a dramatic signature in the Pacific Ocean; with sea surface cooling over the east and central Pacific and warming in the west, extending into the subtropics. Sea-level records also reveal a massive trend across the Pacific: with the east declining and the west rising well above the global average. Basic physical oceanography immediately suggests a trade wind trend as the cause: as this helps pile warm water up in the west at the expense of the east. And sure enough, that is exactly what had occurred with the Pacific wind field. As our study set out to reconcile the emerging divide between observations and the multi-model mean across CMIP5 and CMIP3 simulations, we took a slightly different approach, although there are obvious parallels to Kosaka and Xie’s study assessing the impact of a cooler East Pacific. In particular, we incorporated the recent 20-year trend in trade winds into both an ocean and a climate model, to quantify its impact. It turns out that with this single perturbation, much of the ‘hiatus’ can be simulated. The slowdown in warming occurs as a combined result of both increased heat uptake in the Western Pacific Ocean, and increased cooling of the east and central Pacific (the latter leads to atmospheric teleconnections of reduced warming in other locations). We find that the heat content change within the ocean accounts for about half of the slowdown, the remaining half comes from the atmospheric teleconnections from the east Pacific. Even if the excess heat fluxed into the ocean were longer-term, burying the heat deep in the ocean would not come without its consequences; ocean thermal expansion translates this directly into sea-level rise, with Western Pacific Island nations already acutely aware of this from the recent trends. Our study addresses some important topics but also raises several new questions. For example, we find that climate models do not appear to capture the observed scale of multi-decadal variability in the Pacific – for example, none reproduce the magnitude of the observed Pacific trade wind acceleration – the best the models can do is around half this magnitude. This begs the question as to why this is the case: given the positive ocean-atmosphere feedbacks operating to drive these strengthened trade winds, the answer could lie in the ocean, the atmosphere, or both. The study also discusses the unprecedented nature of the wind trends, and suggests that only around half of the trend can be explained by the IPO. So where does the other half come from? The Indian Ocean is as one possibility, given its recent rapid warming; but models capture this in greenhouse gas forced projections. What else might be accelerating the winds in the Pacific beyond what you’d expect to see from the underlying SST fields alone? The study also points to the length of the wind trend as being crucial to the hiatus; arguing that anything much shorter, like a decadal wind trend, would not have resulted in nearly as much heat uptake by the ocean. This is related to the time-scale for ocean adjustment to wind forcing in the subtropics: in short it takes time to spin-up the ocean circulation response, and then more time to see this circulation inject a significant amount of heat into the ocean thermocline. 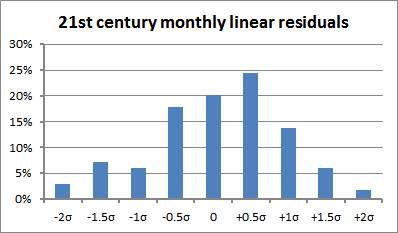 Given the ocean inertia to change, what happens when the trade winds next weaken back to average values? Does the subducted heat get mixed away before this can resurface, or does the heat find a way to return to the surface when the winds reverse? Our initial work suggests the latter: as when we forced the wind anomalies to abate, warming out of the hiatus can be rapid, eventually recovering the warming that paused during the hiatus. So this suggests that whenever the current wind trends reverse, warming will resume as projected, and in time the present “pause” will be long forgotten by the climate system. [Ed: see again Mike’s piece for a discussion of an alternative hypothesis–namely, the possibility that a La Niña-like state is part of the response to anthropogenic forcing itself]. Of course, other factors could have also contributed to part of the recent slowdown in the globally averaged air temperature metric: increased aerosols, a solar minimum, and problems with missing data in the Arctic. Summing up all of the documented contributions to the hiatus, spanning ocean heat uptake, reduced radiation reaching Earth’s surface, and data gaps, climate scientists have probably accounted for the hiatus twice over. Of course each effect is not linearly additive, but even so, many experts are now asking why hasn’t the past decade been one of considerable cooling in global mean air-temperatures? Or put another way, why isn’t the model-observed gap even wider? One way to explain this is that the current generation of climate models may be too low in their climate sensitivity – an argument made recently by Sherwood et al in relation to unresolved cloud physics. A perhaps completely unexpected conclusion when analysts first noticed the model-observed divergence progressing over the past decade. Incidentally, the over cooler tropical Pacific nicely explains (quantitatively — I’m not just speculating) why the rapid warming in Antarctica culminated with the 1990s and appears to have leveled off in the 2000s. Changes occurring in the tropics have truly global effects. See e.g. our paper in Nature Geoscience, 2013. Thanks for the interesting post by Eric and Dr. England. Isaac Held had a post on his blog (http://www.gfdl.noaa.gov/blog/isaac-held/2013/09/23/41-the-hiatus-and-drought-in-the-u-s/) and the discussions there were also very interesting and possible relevant to this post. I generally agree with the point of view on the role of equatorial Pacific in so-called slowdown of global warming, but I have a question to Eric and Matthew: Is it possible that AMO may also contribute to the slowdown (at longer time scales) so that the slowdown may last longer than 15 years, for example, similar to the hiatus from 1940-1970s? I’d analyzed the results from an equilibrium run in CCSM3 and it seems to me the AMO might contribute, but not in a running 11-yr-trend of global SAT. Thank you for writing such a nice paper. The most remarkable thing is, to me, the wind. Figs. 1b, 5b and S9 just say it all. In 2009 Kyle Swanson told RC readers that his work with AA Tsonis indicated anthropogenic warming of the surface air temperature essentially stopped after the 1998 El Nino, roughly, and would not resume until 2020. Much of their work is all about Pacific Ocean dynamics. The warming and cooling phases of the PDO are often characterized as being El Nino dominant (low westerly winds) and La Nina dominant (high westerly winds). What happens if the wind doesn’t abate? Shouldn’t there be an El Nino too at one point – when enough heat is accumulated? This could even mean a linear persistent El Nino mechanism cycle? Also what are the impacts to deep sea lifeforms and how deep does the heat penetrate – only 300 meters? It would be really interesting to see an assessment of cloud formation and convective mixing in regards to England et al and Sherwood et al. Hello Matthew, my dear fellow New South Welshman. It’s a timely paper, well done to all. I believe the former is more scientifically accurate and clear. Plus far less likely to be misinterpreted and/or intentionally misused by others out of context to your actual meaning. “NOTE – This shift in POLICY EMPHASIS from a GOAL based on GHG PPM CONCENTRATIONS to one of AVERAGE SURFACE TEMPERATURE (GMST) ‘appears’ to have been imposed onto the IPCC process by the most powerful National Governments in the UNFCCC. “NOTE: The last 5+ year emphasis by denier activists and recalcitrant anti-Science National Governments & Legislators has been on the idea of a HIATUS-PAUSE in TEMPERATURE INCREASES. Keep up the good work. Have a cold beer for me at The Rocks next time you’re there. Eric Steig: ..rapid warming in Antarctica culminated with the 1990s and appears to have leveled off in the 2000s. Changes occurring in the tropics have truly global effects. Doesn’t this also suggest that the temperature gradient in the Northern Hemisphere is further increased, hence contributes to the science around jet stream anomalies (Francis et al., Screen, Overland and more). Eric Steig @ 1 – The NCAR CCSM4 climate model used in Meehl et al (2013) exhibits a marked warming (cooling) in Antarctica with the positive (negative) phase of the IPO. See figure 1. Excellent post Matthew, and congratulations or your media work on this study, which has been impressive for its clarity of explanation. Err, not unless you’re prepared to posit some complex, saw-toothed, far-from-parsimonious fitted function … one with at least five parameters*. Perhaps a trunk-waving elephant? Thanks to Matthew and Eric. My understanding is that heat storage in the upper few hundred meters hasn’t increased much at all over the past decade. The observed change has been an increased proportion of heat accumulation occurring below 700m. Would increased amounts of heat being taken into the oceans also indicate increased amounts of CO₂ being absorbed? Ie, if there’s more cold, old water accessible to take up heat would that also take up more CO₂? > (Francis et al., Screen, Overland and more). No, you have that backward. the Arctic area warms faster than the overall N. hemisphere. … the site of the jet stream—the border of the polar vortex—is set by a sharp boundary between cold Arctic air and the more moderate temperatures of the mid-latitudes. As the Arctic warms, that boundary becomes diffuse, and the jet stream is less likely to be pinned at the edge of the Arctic. Am I right in assuming that, even if this occurs, it will be too late to shed much moisture on CA and the rest of the parched West this year? What might the consequences be globally, especially if this turns into another major El Nino? After 2011 I would presume fairly high numbers as the winds have been a bit calmer in that period. If the trade wind acceleration has led to an increased differential in the western Pacific sea height over that of the eastern Pacific, and an increased differential favoring ocean heat accumulation over surface and atmospheric warming, one would expect each of these phenomena to act as a brake on their further growth. What might be the result – would it imply mainly a return to more normal rates of surface warming, or would it be expressed as a temporary supernormal surface warming? I suspect a little of both, but I would be interested in further empirical or model evidence, including a consideration of the timescales that are likely to be involved. “My understanding is that heat storage in the upper few hundred meters hasn’t increased much at all over the past decade”. Thanks very much for this post. It is just the topic I wanted to see. Regarding surface air temps vs ENSO, John n-g already graphed El Niño, neutral and La Niña years and the three trend lines are very close to parallel. If these trends continue, then as soon as La Niña catches up with the big El Niño of ’98 surface air temperature will go up with the slope of those lines even without another El Niño. For a look at global circulation, hop on over to Steve’s place. It would be interesting to see if the shipping records of the China Trade ( a surprisingly well archived subject ) hold any useful infromation about decadal variations in the trans-pacific trade winds , which might lead to reconstruction of patterns attributable to El Nino and ENSO. A journal called The American Neptune specializes in the history of 19th century navigation . Re Hank #14, sorry if i wasn’t very clear – and i think Francis is only referring to the horizontal “thickness” or temperature gradient, not the vertical distribution (which i meant) and ripple effects from jet anomalies. From the recent Met Office release The Recent Storms and Floods in the UK which makes a great read, however they do not address sea ice loss, what i don’t understand, since there is a lot science already – even if still heavily studied. During December and January 2013/14 the pattern of winds over the North East Pacific and North America was very disturbed (Figure 13, right panels). The North Pacific jet was deflected a long way north, with a secondary branch extending southwards into the tropical Pacific accentuating the separation of the Pacific and Atlantic jet streams. The effects of this over North America and into the North Atlantic were profound. The deflection of the jet to the north led to colder air being carried south over Canada and the northern US (as seen in Figure 13) to enter the North Atlantic jet and establish a stronger than normal temperature gradient at the entrance of the North Atlantic Jet. This acted to strengthen the jet and provide the conditions for active cyclogenesis, which in turn led to a sequence of strong storms across the UK throughout December and January. As Figure 13 indicates, the North Atlantic jet was, on average, as much as 30% stronger than normal. Similar, but weaker, conditions can be seen in the southern hemisphere, mirroring those to the north and supporting the view that the tropics were driving at least some of what has been experienced this winter. The polar jet stream is then deflected a long way south over the US bringing cold air with it It is well understood that El Nino and its cold counterpart La Nina have major effects on weather patterns around the globe. Indeed the changes in the jet stream over the North Pacific, described above, are typical of what is observed during La Nina events (Figure 15), with the jet being deflected to the north by anomalously high pressure off the western seaboard of the US, and with a variable jet to the south along which disturbed weather forms. The polar jet stream is then deflected a long way south over the US bringing cold air with it In the North Atlantic, ocean temperatures continue to be above normal near 300N which would also contribute to a strengthened north-south temperature gradient across the storm track, aiding the development of storms. As Figure 16 shows, the sub-tropical Atlantic is currently warmer than the average for the last 30 years (1981-2010), but substantially warmer than it was 30 years prior to that (1951-1980). Over the last 3 years there have been major advances in Met Office capabilities in simulating weather and climate variability20; for example, the climate model (HadGEM3) is now able to simulate the frequency of atmospheric blocking in the Atlantic that agrees with observations. These advances have come primarily through increased horizontal resolution (from typically 150km in the atmosphere and 10 in the ocean, to 60km and 1/40 respectively) and increased vertical resolution (from 38 levels in the atmosphere and 40 levels in the ocean, to 85 levels and 75 levels respectively). This has facilitated substantial progress to be made in simulating and understanding the processes that determine the natural variability of the climate system (such as the North Atlantic Oscillation (NAO) and El Nino/La Nina and its global influences), and its response to factors such as solar variability and declining Arctic sea ice. I meant to write “Francis is only referring to the vertical “thickness” or temperature gradient, not necessarily the horizontal distribution” -which comes from changes in the jet. That’s at least my take away when she says the evaporation is weakening the 500mb layer. Does the subducted heat get mixed away before this can resurface, or does the heat find a way to return to the surface when the winds reverse? I’ve heard this a few times and am unsure what the putative mechanisms are for this heat transfer. Is it really that heat is transferring out of the ocean into the surface air, or that transfer of heat into the ocean slows down, which leaves more heat at the surface? Or something else? I would have thought that ocean expansion would have confirmed the conjecture of heat take-up in the oceans. But that measurement isn’t mentioned. A vigorous spectrum of interdecadal internal variability presents numerous challenges to our current understanding of the climate. First, it suggests that climate models in general still have difficulty reproducing the magnitude and spatiotemporal patterns of internal variability necessary to capture the observed character of the 20th century climate trajectory. Presumably, this is due primarily to deficiencies in ocean dynamics. Moving toward higher resolution, eddy resolving oceanic models should help reduce this deficiency. Second, theoretical arguments suggest that a more variable climate is a more sensitive climate to imposed forcings (13). Viewed in this light, the lack of modeled compared to observed interdecadal variability (Fig. 2B) may indicate that current models underestimate climate sensitivity. Finally, the presence of vigorous climate variability presents significant challenges to near-term climate prediction (25, 26), leaving open the possibility of steady or even declining global mean surface temperatures over the next several decades that could present a significant empirical obstacle to the implementation of policies directed at reducing greenhouse gas emissions (27). However, global warming could likewise suddenly and without any ostensive cause accelerate due to internal variability. To paraphrase C. S. Lewis, the climate system appears wild, and may continue to hold many surprises if pressed. We thank Isaac Held and Lord Robert May for helpful comments on earlier versions of the manuscript. Swanson called it a pause in warming, and he was saying it could last until 2020. Tsonis is now saying the SAT pause will last until 2030. He’s betting on lots of repeats of the 2011 La Nina. The warm layer may float on top, stay separate from the cold deeper water, so the thermocline is deformed by the wind (warm water pushed to one side of the ocean, then pushed back to the other side — the thermocline is deeper where the warm water is temporarily piled up). Or, some of the warm water mixes into the deep water. I’m trying to paraphrase, don’t trust me (grin). Awaiting correction. Big difference. HUGE difference, actually. This makes it even more clear that he was not predicting we’d see a pause until 2020. He’s saying, in essence, you can flip a coin, because currently it is impossible to predict with any precision in advance when natural variability will cause temps to uptick or downtick. Fairly summarizes the point Swanson was making. It is unclear to me why you’re continuing to flog this dead horse. 1. Some people say that global warming is not taking place because there has been a slowdown for the last few years in the increase of surface temperatures. 2. The same people do not deny that, in the geological past, there have been periods of natural warming; on the contrary, they use that fact in order to say that climate fluctuations are something natural. 3. As a result, they do not deny that there has been a warming curve of surface temperatures, about 10 000 years ago, that led to today’s warm period. 4. If data show that that warming curve was not neatly regular, but that there were “slowdowns” in it, then their argument explodes, because these slowdowns didn’t change anything to the end-result, ie. today’s warm period and its increase of 5° C in mean temperature. Can anybody tell if the above makes sense, and whether it’s already been developped, and if so, which data about the last deglaciation could be used? PS: I am putting aside the reevaluation of surface temperatures, the energy that has gone into heating oceans, etc., in order to concentrate on the hollowness of the argument itself. JCH is quoting from the 2009 paper. Note that “pause in warming” there doesn’t mean a pause in warming the planet; it means a pause in the perceived surface temperature where we live. Think of the playground game “crack the whip” — pauses, and surprises. Four pages of results, if you follow that link. Worth a look. The coefficient of expansion of ocean water at a depth of 1000 meters is half that of the tropical surface. It seems to me the practical implication of this study is that we should be producing all of the energy we can from an ocean thermal energy conversion system that moves heat to this depth. Thank you for that manuscript. The role of the oceans tends to be under-appreciated in climate models. Much of the “pause” and previous warming could be just internal variablility associated with ocean dynamics. I have a question about the sea level rise (the lower left figure in the group of four, fist image): Is this sea level change “on top of the global average” or is it the absolute values including all factors? The reason I ask is I live in HI and I’ve seen some substantial changes in some of our beaches in the last 30 years with the biggest effects of erosion occurring during a period about 10 to 15 years ago with some leveling off somewhat over the last 5 to 10. The figure seems to indicate (current?) stability in sea level for HI (light blue to white). If this buildup to in water in the Western Pacific were to change and reverse direction, I should expect to see a change (return? increase?) in the same erosion patterns — if that erosion is caused by sea level rise (which is the only explanation anyone here can give). Your comments would be welcome. Thank you Dr England for a fascinating post and paper. I will admit to a certain prejudice- but I do think the ocean will eventually get it’s way. In support, my colleagues try to persuade me that, over the past couple billion years, the oxygen level in the air has been determined dominantly by the life in the oceans. My best guess is that it might be a mistake to ignore 70% of the planet’s surface. Water driven across the Pacific reaches the Maritime Continent. It is warm. The ‘continent” slows it down. The rain from water that evaporates from the warm Pacific blows on ahead. The warm water left behind becomes dense with salt. The dense water sinks and may become entrained in cold north-south currents. The PIG melts from below. Sorry, perhaps the wrong time and place to ask but, do any findings of atmospheric water vapor from NVAP-M shed any light (or any doubt?) on the “slowdown”? Or, in general, anything concerning feedbacks, warming and model projections? For instance, Weather and limate analyses using improved global water vapor observations, Vonder Haar, Bytheway and Forsythe – http://onlinelibrary.wiley.com/doi/10.1029/2012GL052094/pdf ? Hank, without your input i wouldn’t had read the Met Office study. And you were correct, judging per Francis. ps. i created a small graphic to visualise the driver of current northern hemispheric weather. 1 (full post), based on recent studies. England et al. show that this increased ocean heat uptake — which has occurred mostly in the tropical Pacific — is associated with an anomalous strengthening of the trade winds. Maybe the trade winds are stronger because of the increased Arctic sea ice cover, variability. Hank – it’s not a game. The definition of global warming is the surface air temperature. If it goes up, we have global warming; if it stays flat, we have a pause in global warming; if it goes down, we have global cooling. You make judgements with no knowledge of what say. I commonly tell skeptics at Climate Etc. that people can draw fairly long flat lines, even descending lines, in the SAT data. It’s obvious that can be done. Then I tell them they would really have something if the oceans were also cooling, which they aren’t. To me “a fraction” denotes a small amount. If you look at their graph, fig 4, their analysis finds natural variability played a small part in the post-1970s warming. Others may disagree with my interpretation of the graph. “…have no objection to people tracking the accumulation of heat …”. Unfortunately, we both assume that actual evidence is more important than opinion. JCH above quoting Gavin, saying Gavin agrees with JCH’s definition? As I read Gavin’s words, he distinguishes “air” temperature (JCH’s idea) from the change in the surface (land and water/ice) temperature. “the” definition used to be air temp., when it was all we had. This topic is about water temperature, for example. Hank @31, thanks. That makes it sound like I was more confused than I thought. My question, thinking more clearly, came down to asking whether the ocean is warmer or cooler than the atmosphere — so is El Nino / reduced trade winds going to cause heat flux from ocean to atmosphere, or merely reduced heat flux from atmosphere to ocean (either way, the atmosphere gets warmer). I was reading “the heat will come back up” as meaning a heat flux from ocean to atmosphere. But it seems like I was just barking up the wrong tree, and this is not what the interesting scientific question is… I’ll need to read more to understand this. First, the Swanson, et. al. paper, to which you linked, has no fig. 4. Their paper firmly states, “This result is another link in a growing chain of evidence that internal climate variability played leading order role in the trajectory of 20th century global mean surface temperature.” The word “fraction” is an ambiquous term, and cannot be assigned a definitive value in this report, except to say less than the whole. (remember 1/2 and 3/4 are also fractions). My term “much” is just as ambiguous, and chosen based on their statements. Even their penultimate statement that surface temperatures could decline or accelerate over the next several decades suggests higher than “small amount” attributed to natural variability. I can see how these results could be interpretted in many different ways though.